Over the Thanksgiving holiday I was really happy because my son and daughter who live out of state, and my daughter-in-law, and my two grandkids were all in town together for the first time in many years. Last Saturday they called up and announced they were coming over for dinner. I guess when it’s your Mom, you can do that. So I gave them the choice of leftover turkey dinner or My Mom’s Goulash. To a man, they voted for goulash. They had been eating turkey leftovers for two days already where they were staying. So I made a big pot of goulash, and to accompany it, these Cheddar & Bacon Biscuits. During dinner I heard a few Oh Yums and Pass Me the Biscuits. Mom’s know what their kids will like. We’ve had a lot of practice. 2. Cook bacon until crisp and brown. Drain on paper towels, than coarsely chop. Reserve. 3. In a large bowl, combine flour, baking powder, baking soda and salt. Whisk to combine. 4. Add butter slices to flour in 3 batches, turning flour over to coat each batch before adding next slices. 4. With a pastry cutter or two knives, cut butter into flour until it is the texture of coarse meal. 5. Add cheddar cheese, chives and chopped bacon and toss to blend. 6. Add buttermilk gradually, stirring to moisten evenly. You may need to use hands to finish incorporating flour completely and distribute cheese evenly. 7. Using hands, form dough into patties about 3 ½ inches across and 1 inch high. Place on parchment on sheet pan. 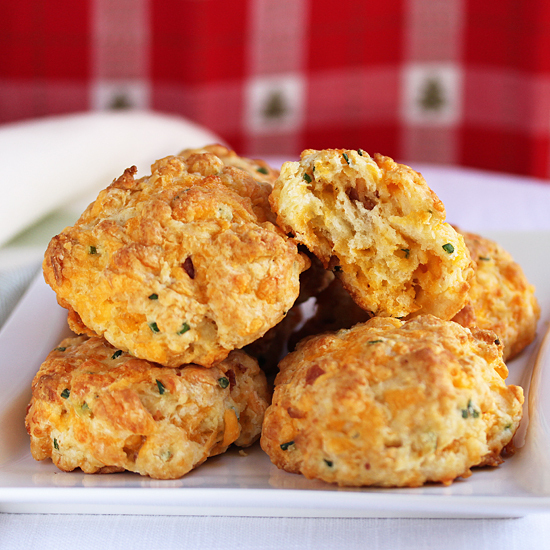 Leave about 2 inches between biscuits. I got 8 biscuits on my pan. They puff up a lot. 8. 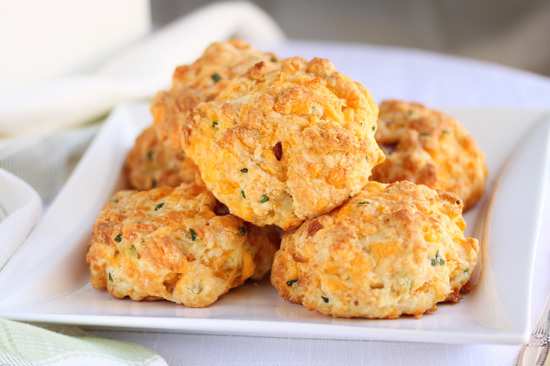 Bake biscuits 18 to 20 minutes, until golden and pick comes out clean. Remove to cooling rack. Continue with remaining biscuit dough. 9. Serve warm or room temperature with butter or honey. Saw your photo on TasteSpotting. The word bacon caught my eye. They look and sound delicious! Those look perfect to go with fall soups. These look to DIE for! Bacon and cheddar should never be separated. Yummmm. I want to make these for Thanksgiving – do you know if I can make the dough in advance and freeze?